We love our Pediped shoes! These machine washable children’s shoes are perfect for kids who love to play in the dirt! It is amazing how easy it is to wash Pediped shoes. Everybody knows that I love the perfect pair of shoes and I am here to tell you that I have fallen in love with a brand new pair. The crazy thing is that these shoes aren’t even for me! They belong to my son. 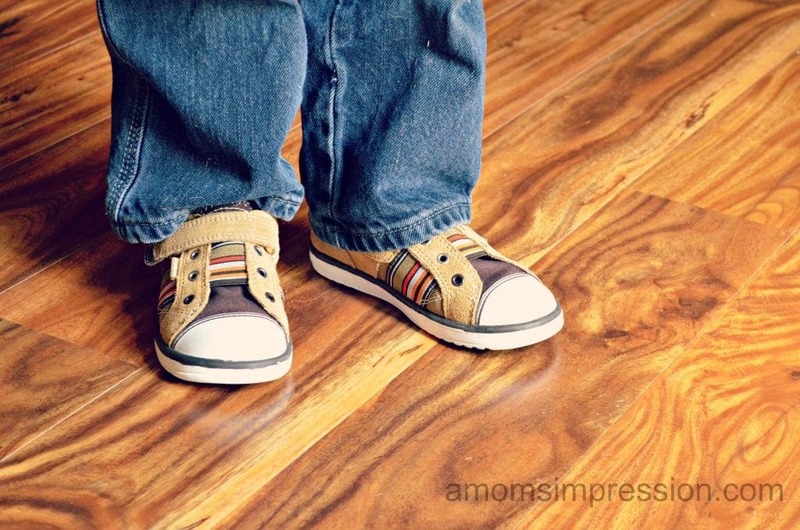 You may be asking what could possibly be so great about a little boy’s shoes? Well, I’ll tell you. We recently had the opportunity to try Pediped’s new machine washable shoes for kids. I was already excited before the shoes arrived because what mom doesn’t need machine-washable footwear? We live in the Midwest so we get ALL of the seasons here. This means that my son will be out playing in all of the elements; wind, rain, snow, mud and dirt! His shoes are constantly getting filthy. Another great feature of Pediped shoes is that they feature Dryz® technology insoles. DRYZ® Technology is an effective moisture management and odor control material that regulates temperature and prolongs the life of shoes. In addition, DRYZ® Technology also cushions impact resulting in added comfort for your child’s feet. To wash, simply remove the DRYZ® Technology insoles and place shoes in the washing machine. For best results, wash shoes alone in cold water, on gentle cycle. Do not add bleach; use regular detergent. Allow shoes to air dry with Velcro open (away from sunlight) before re-inserting the insole. Do no put shoes in the dryer. We received the Joel style athletic sandal in dark brown/orange. I can’t believe how light these shoes are. The soles are flexible and help to provide healthy foot development for my little guy as he grows. These shoes are ultra stylish and could be worn with shorts for a casual look as well as with khakis for a dressy look. I love this because I don’t want to buy a bunch of different types of shoes for him that he will just grow out of in a few months. I would rather purchase one pair of stylish durable shoes that can be worn with just about anything and will last forever, these shoes deliver. 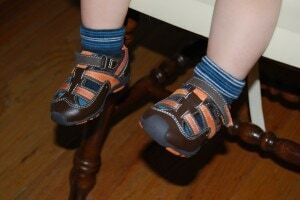 My sone wore his new Pediped shoes to our Mother’s Day Brunch at a fancy hotel, and then turned around and wore them with some shorts to daycare (he looked great at both activities). Recently, Pediped introduced a line of shoes with Memory Foam. “Memory Foam Technology allows the shoe to mold to your child’s foot, acting like a custom insole, supporting the foot in all the right places. It also has excellent absorption, prevents foot slippage in the shoe and improves the fit of every shoe.” This is just another reason why these are the best toddler shoes and the best kids shoes out there! I also love that these shoes come with an additional insole that customizes the fit to each individual child. If the child starts with both insoles, as the child’s feet grow the additional insoles may be removed to extend the length of time the child can wear the shoes. What an ingenious feature for children who grow out of their shoes so quickly. These inserts can make the shoe size smaller by almost one half of a size! Our Pediped shoes are also great to wear to the pool, lake or anywhere that they may get very wet. With their quick drying material, your child’s feet will never stay wet for long. It is also made out of waterproof material, helping to keep your little one’s foot protected from the chilly elements during the colder months. Some select Pediped shoes are also made with a solvent-free manufacturing process. This eco-friendly process results in reduced carbon dioxide emissions and reduced water and energy use. Pediped also has vegan options as well! Other styles of Pediped shoes also feature self cleaning soles, slip resistant soles and temperature rated boots! Go to here to learn all about the other technology their shoes offer. Pediped also has a convenient size chart to use if needed. Just go to www.pediped.com. Their website is very user friendly and they have styles and options for everyone! Never have to worry about your child’s shoes again! With pediped shoes, they literally have your kid’s feet covered! I loooove Pediped shoes! That boy’s style is totally cute, too. Great review! Oh my goodness! These would have been so cool when my kids were little. I love how easy they are to wash. When my son was little he was always getting his shoes muddy. Those are so cute!! I’m going to have to check those out because I have a wee one who is just over a year old and loves to walk everywhere…but hates typical shoes!! oh those ARE cute! I love the pink! LOVE Pedipeds; my friends always do a group order for them . . . we’re all obsessed with them! Those are so cute! Isn’t it awesome when they start to walk? My grandson would look adorable in them! Those are adorable. I don’t know if we have had Pediped shoes, I’ll have to check them out! wow I could totally use machine washable shoes!! They are so cute! We really love Pediped too. They baby ones are so easy to pop right on and the machine washable factor is a huge plus. Oh these are AMAZING!! I’ve not seen them, but I def need some for my 2 kiddos!! They love DIRTY! Cute! I love the brown and pink color combo. This would make a great shower gift. Pediped is such a great brand! I have a pair of the washable shoes for my little man and I can’t wait to try washing them. My little one only wants to wear his Pediped shoes. I love these washable ones! thanks for reviewing these. I saw them and was curious about them.